Island Steel UK Ltd are experts in Wide Coil, Slit Coil, De-Coiled Sheet and Sheared Blanks. | Island Steel UK Ltd trades in and processes steel in Wide Coil, Slit Coil, De-Coiled Sheet and Sheared Blanks. The plant operates as a service centre for the processing of customers own materials as well as for complete material supply to our customers full specifications. 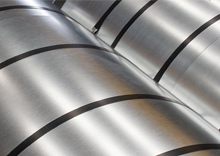 Island Steel UK Ltd is able to supply steel in coil and sheet form to most specifications. Island Steel UK Ltd regards quality management to be paramount to the continued success of the company. Whilst already having in place a full and successful set of training and procedures in place, in 1998, it was decided that Island Steel UK Ltd would register for approval for its quality management systems under the ISO9001:200 standard. Island Steel UK Ltd is able to supply steel in coil and sheet form to most specifications. As a major importer of steel into the UK we are able to provide not only competitive pricing and availability but often, we can cater for customers requiring more unusually specified materials. We have 8 over-head gantry cranes enabling us to manoeuvre weights of up to 32 tonnes. Island Steel UK Ltd trades in and processes steel in Wide Coil, Slit Coil, De-Coiled Sheet and Sheared Blanks. The plant operates as a service centre for the processing of customers own materials as well as for complete material supply to our customers full specifications. The company has now been in business for 14 years and, drawing on many more years of experience within the steel industry. Island Steel UK Ltd regards quality management to be paramount to the continued success of the company. Our Company Quality policy calls for continuous improvement in its operations.